The Clay County African American Legacy Inc., a 501(c)3 community-based organization, was founded in 2000 during the Kansas City, Missouri, Sesquicentennial 150th "Celebration of the Heart." For its community project, the CCAAL Consortium chose to erect a legacy freedom monument that would include a drinking fountain to honor and celebrate African American pioneers and their contributions to Clay County. 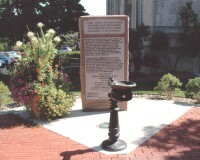 After a successful fundraising campaign, the legacy freedom fountain was erected on the lawn of the old courthouse square in Liberty, MO, and dedicated June 19, 2001. A year later the CCAAL, Inc. commissioned local artist David McClain to paint a 8x10 mural based on the African American pioneers, businesses, churches, and schools that were named on the Freedom Fountain Monument. The mural was dedicated June 19, 2003, and now hangs on the third floor of the old Courthouse administration building in Liberty, MO. 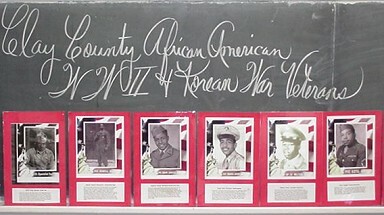 In December 2003, the members of the Clay County African American Legacy Consortium incorporated and purchased Garrison School from the Liberty School District, assuming ownership of the historic educational institution that was originally established in 1877 to educate African American students in Liberty, Missouri. Currently, Garrison School serves as office space for the Clay County African American Legacy Inc. and as a Recreational Center for cultural and educational events. The Clay County African American Legacy Inc. is committed to educating and informing the community of the accomplishments of African Americans of Clay County, and how they have influenced and contributed to the rich history of the Northland. Garrison School provides CCAAL Inc., the opportunity to host community events, exhibits, cultural and educational programs, including annual student scholarships and recreational opportunities, and to establish partnerships with not for profit organizations. Your generous tax-exempt donation will make it possible to keep Garrison School a cultural benchmark and integral part of the Clay County community.